Iron Man 3 Does the black guy live? Iron Man 3 went in a different direction than the other 2 films. I'd almost call this one "The Ballad of Tony Stark". The first 2 films involve a vocal Tony Stark full of wit and personality, but when the action starts he dons the armor and becomes Iron Man. In Iron Man 3, the majority of the film deals with Tony Stark in and out of action. He shows why he was "the guy" who developed the armor as he plays "Macguyver" and incapacitates foes and takes on terrorists using everything BUT his armor. Some might complain that he didn't spend enough time in he armor. I liked it for that. I also liked the treatment of the Mandarin. Being an Iron Man fan, I was wondering how they would pull it off. I like the avenue that was chosen. It didn't spoil the Mandarin to me; as his origin is complicated and would've needed a bit of retooling. Now on to what I didn't like. Ok that I didn't get to see Tony Stark in the armor, but I wanted to see Jim Rhodes in his. They give me Iron Patriot, but don't give me any action for him. By the climax of the movie I was tired of seeing everyone but Rhodes in the Iron Patriot armor. 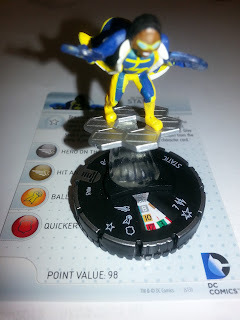 And while I was ok with A.I.M. being the "hidden" villain, the extremis heat generating abilities were a little too much. Some human generates enough heat to nearly destroy an armor. I didn't like that at all. It definitely made them more disposable. While it worked for the direction the film went and the climatic battle scene; I thought it could have been done a little better. Just give them a gauntlet, or some type of tech to disable the armor. The way Iron Patriot got "heated" out of his armor was a little annoying. Still, it wasn't so bad that I didn't enjoy the movie. I was a little unsure how I felt about the removal of the arc reactor from Tony Stark's chest. I liked how it defined him as a tragic hero. He has all of these resources at his disposal, but couldn't handle his heart issue. Although it begs the question, if he had all these resources, why couldn't he cure himself. So I let it go. The after credit scene was awesome! B+ grade for Iron Man 3! 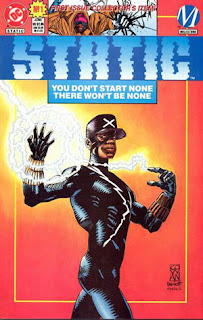 Static is a black superhero named Virgil Hawkins that started out in Millstone Comics; which was an independently owned division of DC comics that focused on minority heroes. Static was created by the late Dwayne McDuffie, who stated that Static was Millstone’s version of Spiderman: a geeky teen who deals with normal teen issues and then has powers and has even more to deal with. He also uses his scientific knowledge as well as his razor sharp wit to battle foes as Static. 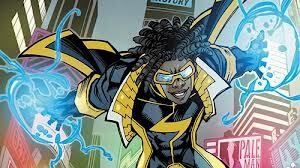 After Millstone Comics stopped publishing, Static was brought to the small screen as the cartoon Static Shock. The show lasted several seasons. 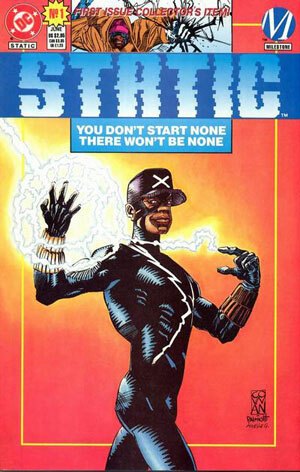 Later Static was integrated into the main DC universe and has since joined the Teen Titans. Also Virgil appeared recently in the second season of the Cartoon Network Young Justice animated series. Virgil Hawkins is a young intelligent high school kid who lets his mouth write a check that his @ss can’t cash. He ends up getting beaten up by a bully. To get revenge, he gets a gun from a friend and sneaks to the site of a huge gang fight planning to shoot the bully in retaliation. Well despite it all, Virgil is not a killer, so he doesn't shoot the bully. But the city arrives to the scene of the gang fight and uses an experiential tear gas that is meant to be used to track the offenders by marking them using harmless radioactivity, similar to the tracking dye used to track whale. The gas ends up granting many of the gang members and other people involved powers and the event is then referred to as the “Big Bang”. Those who gained abilities from the gas are referred to as “Bang Babies”. I think my favorite thing about Static is that he’s a fanboy. He collects comics, is a gamer, and uses a lot of pop culture references. Static comes out at 98 points with 6 clicks of life, 7 range with 2 lightning bolts and the flight ability. The figure on its one is decent. Alternating between Running Shot and Hypersonic Speed is awesome and allows for a little versatile tactics. Damage not dropping below 2 is also cool. A 10 attack is respectable. Although his attack drops to an 8, we are in the age of the Utility belt and values can always be modified. With Energy Explosion getting the upcoming boost, 3 clicks of it paired with Running shot could be huge. Super Senses provides a decent defense augmented by the Trashcan Lids trait. And Enhancement is just icing. Only a black character would get a trait called Trashcan Lids. Honestly for most of Static’s appearances (comic or animated), Static would use a trashcan lid or manhole cover to fly. The trait is cool, but they could’ve though of another name. Enhancement could work nicely as Static could carry a ranged attacker, use Running Shot or Hypersonic to attack and setup the sniper he carried for a shot the following turn. My only real, but MAJOR gripe is the LACK of keywords and team ability. 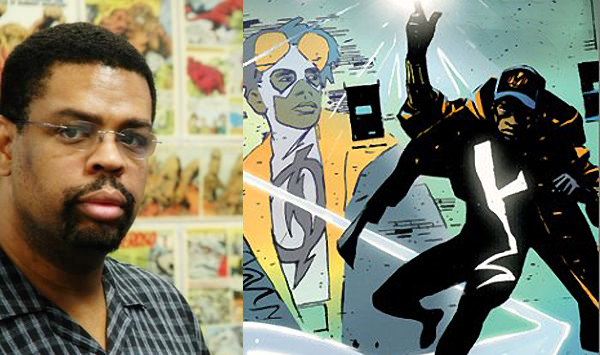 Static is just as much a scientist as Peter Parker and he’s a teen that’s been hanging out with the Teen Titans. With theme teams becoming more and more part of the meta-game…this is a major disadvantage. And it wasn’t like there weren’t options. I would have given perplex instead of enhancement as well. SCULPT - 3 out of 5 stars. It's ok, but room for improvement. TWO WORDS: FORE-HEAD! CREATIVITY - 3 out of 5 stars. The trait is cool, there could've been a bit more. ACCURACY - 4 out of 5. Even though there could've been a bit more power-wise, what the figure has fits and works! Its not what you might think. I admit to being a superhero fanboy and when I found out about the Mission Marvel that Disney was doing with their Phineas and Ferb show; only one thing came to mind..... AWESOME! Oh geez...really guys? I mean I have just as much fanboy lovin' for Mavel heroes as the next nerd...But the level these guys are taking it to is ridiculous! Let me give you a little backstory so you can understand. Phineas and Ferb is a kids show about 2 brothers who have fabulous adventures and create impossible devices; all while their older sister is trying to prove to their mother what the boys are doing. And in Disney fashion, after a song or two, everything is gone by the time the mother appears. The show also includes....wait for it...an evil scientist and a platypus that's a secret agent. So yeah, we're talking really serious stuff...lol. Well in the Mission Marvel story, the heroes lose their super powers. Would you believe the fanboys are cursing like sailors over continuity issues like "Iron Man is in a suit, how can he lose his powers? If the Hulk loses his powers, why is he still green?" These guys are almost making me ashamed to be a nerd. Its one thing not to like the story. Its another thing to b!$#* and moan about something that has the lasting effects on continuity of an SNL sketch. Let's just be real here. Marvel was dying. All of my fanboy love and the love from my fellow fanboys wasn't enough to save it. Things like this "crossover" only help to keep our heroes alive. Through the show, our beloved heroes will be exposed to a totally different audience (and their parents) which will undoubtedly create a new legion of fans that will grow up loving the heroes. How is that a bad thing? And frankly, with the way Lucus was messing up Star Wars; you guys better hope that Disney does similar endeavors. My advice to those ultra crybaby fanboys is leave the sanctity of your mother's basement, put down their still mint-in-box limited edition action figure, walk around in the sunlight for a short while and quit treating your/OUR favorite heroes like sacred cows.